Also at some point in February, YouTube will remove its few remaining Google+ features. The Google desktop navigation bar notification bell widget will disappear on March 7th. This is currently only used for Google+, Google Photos and Hangouts Chat (for G Suite) notifications. The alternative is to use browser notifications instead. Rarely used Google Groups settings will be removed in May 2019 and other settings will be updated. If you are using Google Groups, be sure to check the details about what’s changing. Facebook announced new features for community building, including new Group management tools and filters, the ability to create Mentorship programs for all Groups, and Page admins will now be able to respond to Instagram Direct Messages from their Facebook Page inbox. Twitter announced they have 321 million monthly users, down from last quarter. Going forward they will only share the number of “monetizable daily active users” , which makes it hard to compare with other social media platforms. A few Plussers have tried to compare Twitter’s 126 million “mDAU” to the estimated 111 million active Google+ users had in 2015, but that’s like comparing apples to potatoes: the Google+ number was a rough approximation based on a lot of extrapolation of how many Google+ Profiles had at least one public post ever in Google+’s then 4-year history. That seems pretty low compared to Twitter’s daily users. But, on the other hand, public post numbers don’t take into account private posting or other activity. And on the third hand, that estimate was made before Google+ separated from YouTube and was totally redesigned. As Google hasn’t provided any actual numbers in many years we may never know how Google+ compared to other social media platforms, but I’m willing to bet that over the past year it’s been significantly less than 100 million active users per day. YouTube CEO Susan Wojcicki took a rosy look back at 2018 and forward to the coming year. “Billions of comments were made” and there are lots more channels earning six figures and with more than a million subscribers (no exact numbers were given). She announced three goals for 2019: “supporting creator and artist success”, “improving communication and engagement”, “living up to YouTube’s responsibility”. It’s pretty similar to her 2018 priorities for Creators, so it seems YouTube trying to continue moving in the same direction. YouTube Memberships - similar to Twitch Subscriptions or Patreon Sponsorships - are now available to Partnered channels with at least 30,000 subscribers. If you are wondering how Recommendations on YouTube work, be sure to check out last week’s AMA with the product team in the official YouTube community. Periscope, Twitter’s live streaming platform, now lets you go live with guests, and invite anyone in your audience to join your broadcast. Skype on desktop will now blur your background, so you don’t need to tidy your room or office before your next video call. Google Search Console is going to start assigning search metrics to a single Google-selected canonical URL. That will combine search metrics for single pieces of content that may use multiple URLs, for example separate mobile or AMP pages. There are now more than 5 million paying businesses using Google’s G Suite, which includes email, Docs, Sheets, Slides, Drive, Hangouts and Google+. That’s just a small fraction of the number of free users, of course. February is Black History Month, and Twitch and YouTube are celebrating Black creators. There’s a new dancing Childish Gambino Playmoji pack for AR Playground on Pixel phones. They are going for a realistic look, and he will even react to your facial expressions. Google wants to see your dance moves alongside him in a #pixeldanceoff . Google is working to make your accounts more secure: For web browsing there is a new Google Password Checkup Chrome extension that will warn you when sign in to a site using compromised credentials And to secure more devices Google introduced Adiantum, a “new form of encryption … built specifically to run on phones and smart devices that don’t have the specialized hardware to use current methods to encrypt locally stored data efficiently.” This allows many more devices, including smart watches and internet-connected medical devices to encrypt sensitive data. Google launched two new Android apps for the deaf and hard-of-hearing: Live Transcribe uses cloud-based automatic speech recognition to display spoken words in more than 70 languages. Sound Amplifier lets you use your wired headphones with your smartphone to augment sounds in your environment while reducing background noise. Read on for more links, tips and updates for Plussers, webmasters and more. Image: Thursday, February 14th is Valentine’s Day. These candy hearts are for all of you. (photo by parnote on Wikimedia Commons, Public Domain). 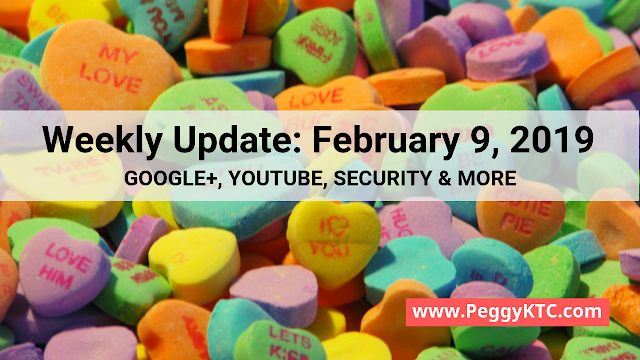 Google has a look at love in 2019 and explains how you can avoid the heartache of Valentine’s Day planning with Google. Hi Nikhil: the current policy is that you cannot show more ads than the content can support. For some pages that might be one ad, for other pages that might be 4 ad units. So while you can add as many as you can, that would violate policy unless you have enough content to support all those ads. See the "valuable inventory" policy for more details. Abhsinchau: auto ads only display if and when AdSense thinks it's good to put an ad. That makes it harder to troubleshoot. Check your AdSense Reports to see if your ads are actually getting impressions - it's possible other people see ads, even if you do not. I'm wondering if the recent changes will lead to Google finally updating the Blogger app, because it always needed room for improvement and over the last few weeks, I have had trouble publishing posts via the app - it always claims there was a "network error". Hi Comicbookrehab: the Blogger mobile app isn't currently supported, so I'm not surprised that you are seeing errors. Do send feedback to Blogger from www.blogger.com to let Blogger know you would like to have an improved mobile app.